Concrete repair keeps the public safe and property appealing. Managing property involves identifying and repairing safety hazards that can lead to injuries. Plus, those concrete-related safety hazards also diminish the property’s curb appeal. Our job is to help keep your property’s concrete surfaces safe and visually appealing without inconveniencing tenants and guests. 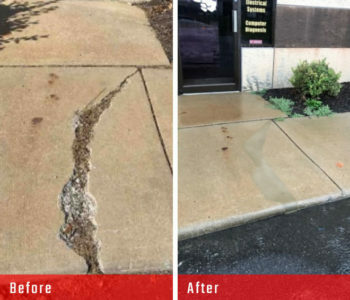 Commercial Concrete Solutions’ concrete repair technology lets you repair, not replace, critical surfaces and walking paths, which is good for your budget and maintaining curb appeal. Quality Hill Apartments had a deteriorating staircase, which was a serious trip hazard and an eyesore for residents and prospective tenants. Rather than inconveniencing residents for a long period of time and using budget to replace the stairs, Quality Hill’s management team contacted CCS. 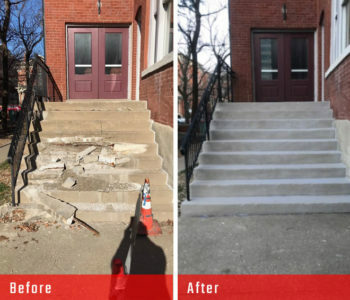 Our team was able to overlay and repair, not replace, the stairs at a fraction of the cost with the same longevity of a replacement job. Plus, the stairs help keep the property’s curb appeal high for residents and those considering living in this historic neighborhood. Realpac was dealing with cracks and spalls in a sidewalk. They negatively effected the building’s exterior appeal, created a tripping hazard, and were letting water seep in which would cause the sidewalk to deteriorate even more, sooner. Rather than tear out and replace the concrete sidewalk section, CCS was able to repair the affected area in just a day. The repair is as strong and durable as a more time- and money-consuming replacement. Bonus, it could be walked on in just 15 minutes. 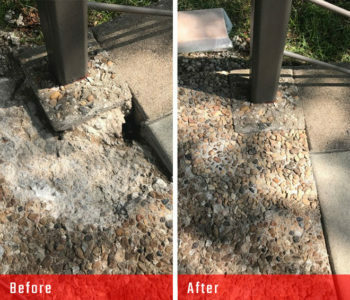 Many times, where there is spalling and deteriorating concrete curbs, there are trip hazards and the potential for serious injury and lawsuits, not to mention the negative impact on the visual appeal. Varnum Armstrong Deeter chose CCS to provide a permanent solution to a common problem – trip hazards. CCS repaired curbs and spalls without interfering with business and life as usual. To up the curb appeal, we carefully matched our repair work to the existing color so everything blends.